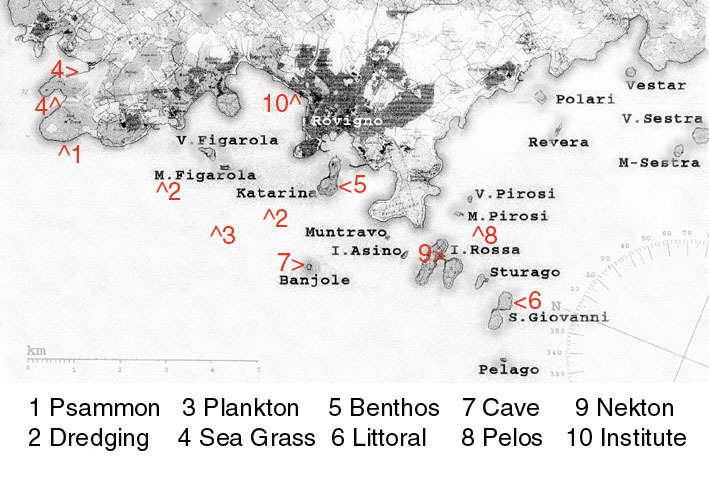 The following report does not provide a comprehensive list of species present in this section of the Adriatic Sea, but rather is a reflection of the organisms found and dealt with on a personal perspective. 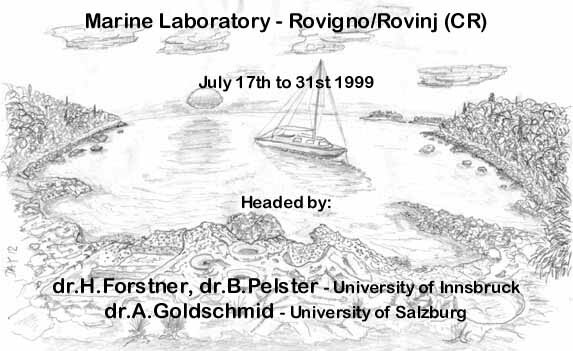 The vastness of samples retrieved is not even fully displayed since it would require more than the two weeks to monitor, map, and produce appropriate sketches of each species. Before going into any details, a quick reflection about Rovigno is appropriate (City guide). 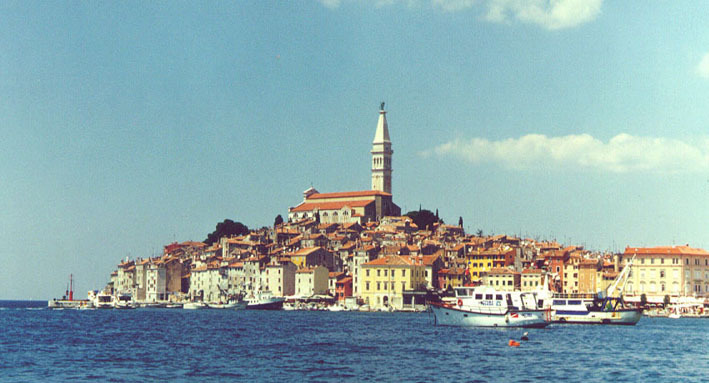 Rovigno is a lovely provincial village at the west coast of the Istrian peninsula belonging to the recently established state of Croatia. Lying in the north-eastern corner of the Adriatic sea, water currents running along the shore in a counter-clockwise direction constantly supply more or less pristine salt water. 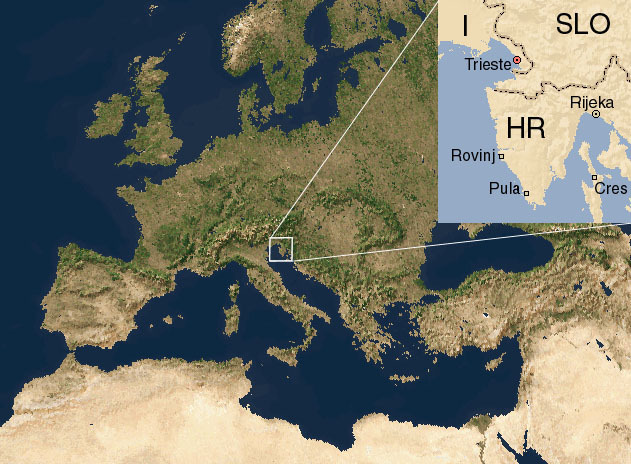 This one-way flow guarantees that the pollutant laden waters of the river Po (on the opposite side of the Adriatic Sea) from industrial and agricultural plantations of the heavily entrepreneurial activity of northern Italy do not interfere with the unspoiled waters of the Istrian coast. In addition, the quality of the surrounding waters of Rovigno have improved significantely after the implementation of a recently finished sewage processing plant. Because the marine environment is so complex, it is divided into subunits called zones. The open water environment is the pelagic zone, and the seafloor environment is the benthic zone. The pelagic zone is divided into the coastal or neritic zone above the continental shelf and the oceanic zone or deep water away from the influence of land; since the upper Adriatic Sea hardly is anything deeper than 50m, it is considered to belong to the coastal or neritic zone. The surface, where there is enough light intensity for plant growth, is known as the photic zone, and can extend through both the neritic and oceanic zones. Deeper zones where almost no sunlight penetrates are represented by the dyphotic zone (twilight) and the aphotic zone (no light). Almost at the bottom of the trophic pyramid is the Plankton . It may be defined as a carpet of floating or drifting organisms with limited powers of locomotion and are transported primarily by prevailing water movements. Members of this group range in size from microscopic plants to jellyfish measuring up to 2m across the bell and includes the eggs and larval stages of nekton and benthos. Subdivisions of plankton include virio-plankton (pico- and nano-particles), bacterio-plankton (bacteria), phyto-plankton (microplanktonic flora), and zoo-plankton (micro- to meso-planktonic fauna or any benthic organism with a biphasic lifecycle). 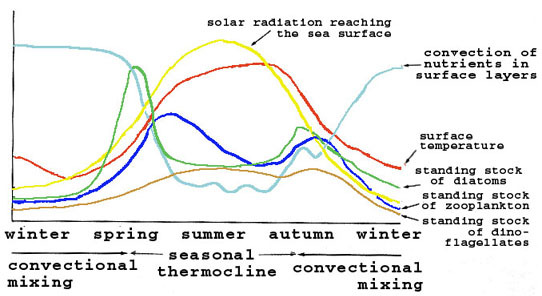 Apart from diurnal migration patterns of planktonic organisms, seasonal fluctuations in the composition of the plankton result mainly from atmospheric influences in which temperature and the amount of incident light as well as water movement per se determine the actual distribution of planktonic organisms. Spring usually triggers the first larger biomass production (phytoplankton) followed by the increased production of zooplankton (mostly copepods, crustaceans, meroplanktonic larvae of benthic animals, and hydro-medusas) that peak in early summer. Phytoplankton or free floating planktonic plants, are usually single celled, (unicellular, filamentous, or chain forming species) that inhabit the photic zones of surface waters in open oceanic and coastal environments. Although unicellular forms comprise the bulk of phytoplankton, some green and blue-green algae are filamentous or even colonial, like diatoms and the blue-green algae. In addition, a number of diatoms and dinoflagellates produce chains of loosely associated cells. Phytoplankton encompasses a rather wide diversity of algal groups. According to their size, these diminutive autotrophs can be further categorized into ultra-, nano-, micro-, and macro-plankton. 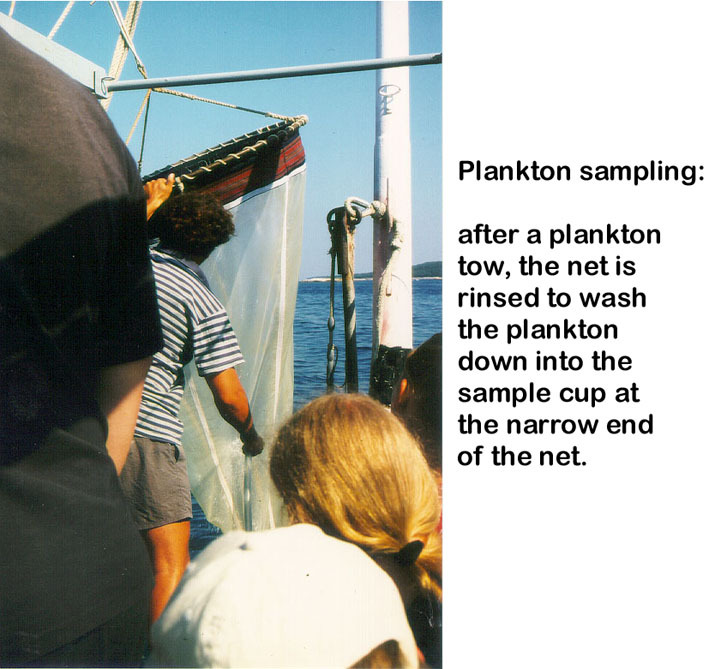 Net plankton samples embody all phytoplankton retained by the finest nets (ca 64mm apertures) that can be conveniently towed, and in coastal waters, tend to be dominated by diatoms and dinoflagellates. As the nanoplankton pass through the fine mesh nets, large numbers of coccolithophores, flagellates such as those of Chrosophyceae and Cryptophyceae, and small species of diatoms are most abundant among trapped species. Diatoms with their characteristic yellow-brown pigment that masks their green chlorophyll, are also called golden algae. 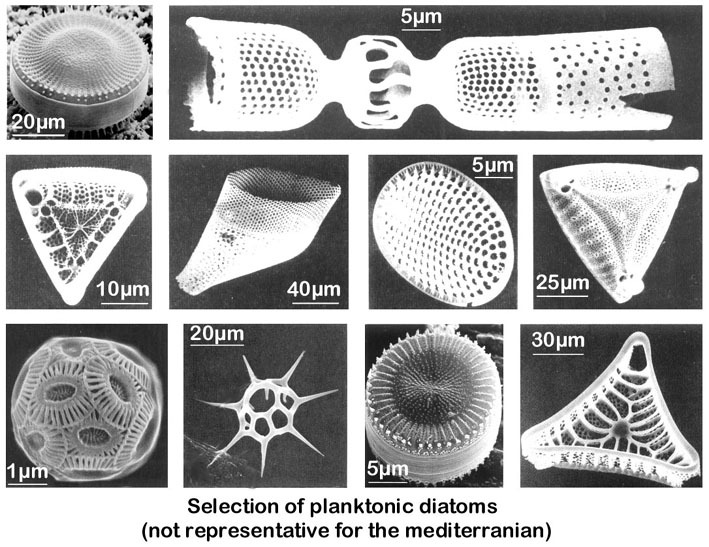 Some diatoms show radial symmetry in that they are round and shaped like pillboxes (Astereolampa marylandica), while others display bilateral symmetry and are elongate (Chaetocerus lorenzianus). A hard, rigid, transparent cell wall impregnated with silica surrounds each diatom. Pores connect the living portion of the cell inside to its outside environment. The buoyancy of the diatoms is increased by the low density of the interior of the cells and the production of oil as a storage product. In addition, some diatoms have spines or other projections that increase their ability to float (Chaetocerus sp.). Their large surface area also provides them with greater exposure to sunlight and water containing gases and nutrients for photosynthesis and growth. Diatoms produce very rapidly by cell division, which can lead to algal blooms. Diatoms are most important as primary producers, and those that are not consumed by herbivores eventually die and sink to the sea floor. Dinoflagellates are red to green in color and can exist at lower light levels than diatoms, because they can both photosynthesize like a plant and survive heterotrophically by ingesting organic material just like an animal. Their external walls do not contain silica; some are smooth and flexible but others are armored with plates of cellulose. Dinos usually have two whiplike flagella that beat within grooves in the cell wall, giving the cells limited motility. Under favorable conditions, they multiply even more rapidly than diatoms to form blooms, but they are not as important as the diatoms as a primary ocean food source. The Zooplankton are either herbivores, grazing on the phytoplankton, or carnivores feeding on other members of the zooplankton. Many of the zooplankton have some ability to swim and can even dart rapidly over short distances in pursuit of prey or to escape predators. They may move vertically in the water column, but like phytoplankton, they are also transported by currents. As a result of convergence zones and boundaries between water types, zooplankton exists in patches of high population density between areas that are less heavily populated. Such high population patches attract predators, whereas the more sparse populations between the denser patches preserve the stock. Turbulences and eddies favor dispersal of individuals from the densely populated patches to the regions sparsely populated. Some species obtain nutrition by direct uptake of dissolved organic nutrients (DON) but most species gather food via filter feeding or raptorial feeding patterns. Filter feeders employ tiny hairs or mucous coated surfaces to capture mainly phytoplankton. Carnivores such as raptorial feeders, seize and eat individual cells by removing a few selected prey; whereas, the grazing pressure by herbivorous zooplankton regulates the standing crop of phytoplankton populations. Besides predation and filtering, also physical-chemical conditions in marine waters affect species composition, abundance, and distribution of zooplankton. Thus, such microfauna must be capable to adapt to varying stresses associated with biological and physical-chemical factors (temperature, salinity, mass movements of water, and dissolved oxygen levels). 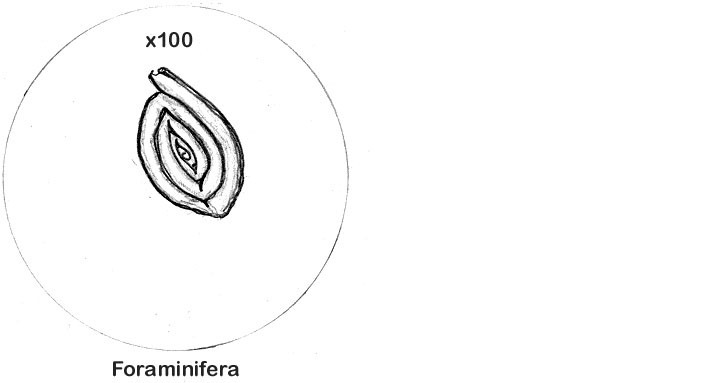 Foraminiferans of the phylum sarcodina and radiolarians of the phylum ciliata, are single-celled microscopic members of the kingdom protozoa. Foraminiferans are encased in compartmented calcareous coverings, while the radiolarian coverings are ornately sculputred and covered with delicate spines. 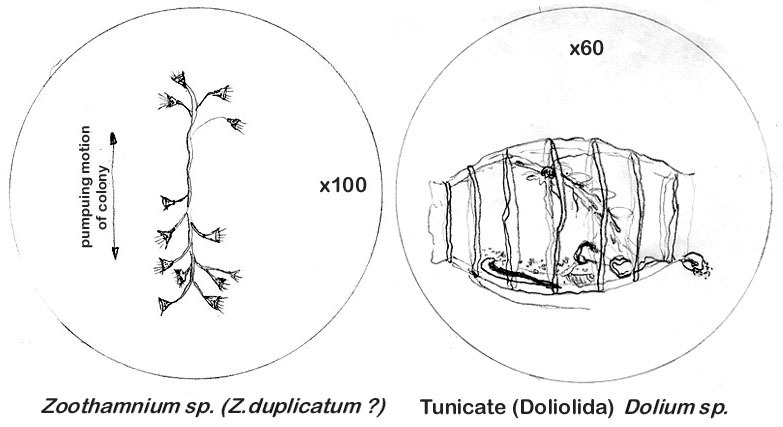 Pseudopodia, many with skeletal elements, radiate from the cell and catch diatoms and small protozoa. After death, their coverings accumulate on the sea floor contributing to the bottom sediments. Among the most common and widespread zooplankton species are the small crustaceans belonging to the phylum artrhopoda. 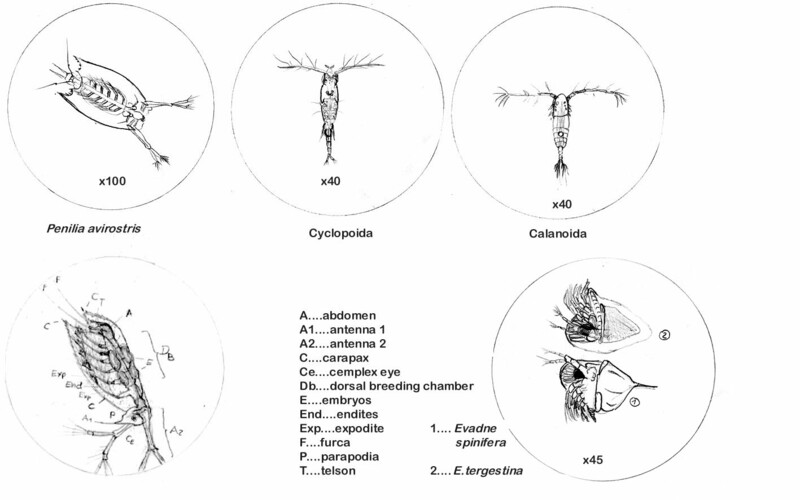 Among others, copepods, euphausiacea, phyllopods and cyclopoida are most common. They are basically herbivorous and consume more than half their body weight per day. Both reproduce more slowly than diatoms do, by doubling their populations only three to four times a year. The smaller, second pair of antennae are the principal swimming appendages of many planctonic species (e.g. copepods); whereas in others (e.g. euphausiacea), the appendages of the thoracal segment are more important. In phyllopods and copepods, the huge pair of antenna function largely to reduce sinking, acting somewhat like a parachute. Other zooplankton include certain swimming protozoans, ctenophores, coelenterates, molluscs, polychaeta, and the eggs as well as larvae of benthic and nektonic animals. All of the zooplankton that spend their entire live cycles as plankton are called holoplankton. 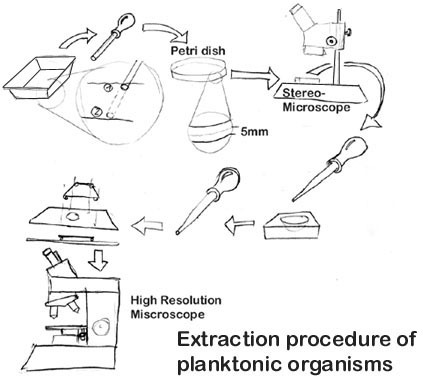 However, an important portion of it spends only part of its life as plankton; these are members of the meroplankton. 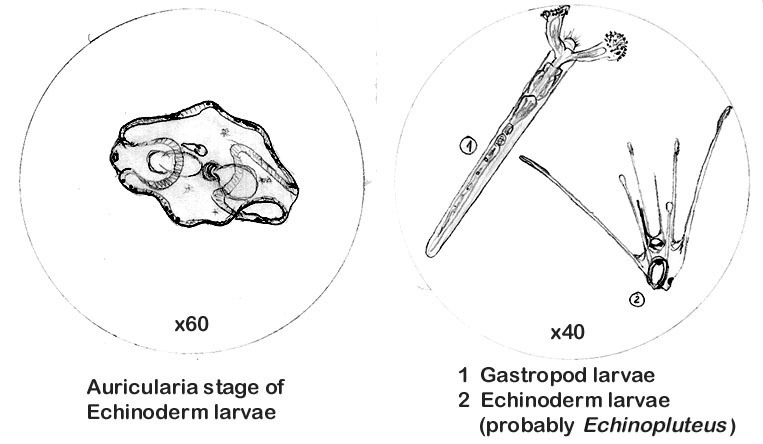 The eggs and larvae of molluscs (veliger), arthropods (nauplius, zoea), echindodermata (brachiolaria, auricolaria), osteichtyes (larval fish), polychaeta (trochophore), and many other organisms are a part of the zooplankton for a few weeks. The currents carry these larvae to new locations, where they find food sources and areas to settle. Another meroplanktonic representative is zoothamnium of the phylum protozoa. It grows and branches in a closely regulated manner to form an integrated multicellular structure. Through the stalk runs a strand of cytoplasm that connects and coordinates the colony members, all of which contract together at any disturbance. 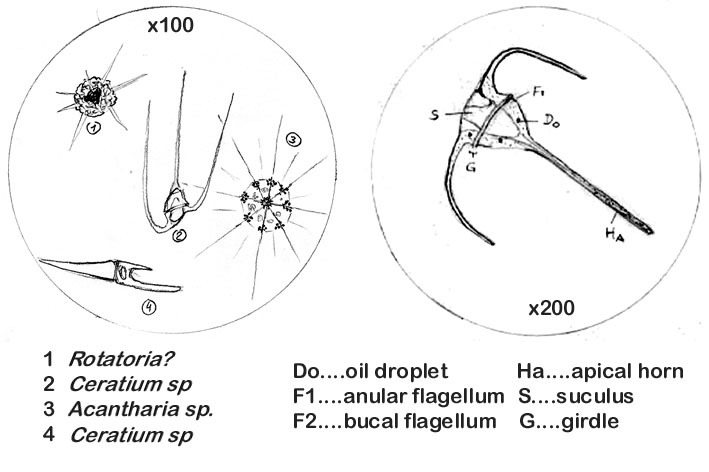 Some pelagic ascidians (phylum tunicata) can be fished with the plankton net. These salps are tunicates that have the buccal and atrial siphons at opposite ends of the body so the feeding current can also be used for locomotion. Bands of muscle in the body wall assist cilia in moving a current of water through the siphons.